In the end, Mr. Rutley was sentenced to 24 months to 4 years, the maximum allowed under Michigan's sentencing guidelines. I attended the hearing and it was clear to me that the judge was moved by Annie's story as he told the defendant he wished that he could give him a longer sentence. It was a dramatic moment in Judge David Swartz's courtroom in Ann Arbor recently, as the prosecutor handed him several pictures. 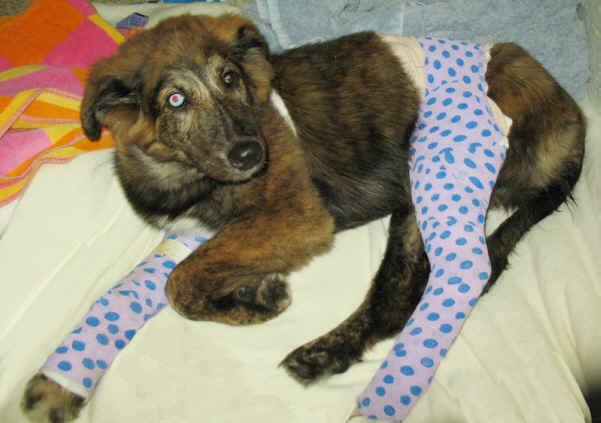 The images depicted a young puppy, badly injured and heavily bandaged, looking up at the camera as if to ask "why?" Then, as the judge listened intently, her guardian began to address the court. The story began late last summer. 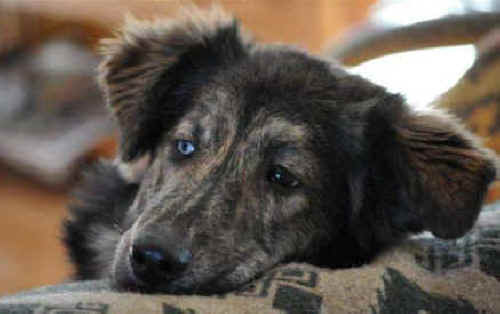 A good samaritan walking her dog in a local park found an injured, cowering Australian shepherd-mix puppy. A cruelty investigator for the Humane Society of Huron Valley took her to the shelter where she received emergency veterinary treatment. Around the same time, police told the investigator that a woman had reported her puppy missing and she suspected her boyfriend was involved. Connecting the dots, the cruelty investigator showed pictures of the puppy who was at the shelter to the woman, and she identified her as 5-month-old Brownie. A police investigation concluded that the boyfriend, Eric Rutley, angry that his girlfriend was not home at the expected time, beat Brownie with a tire iron, injuring her legs and knocking out several teeth. Prosecutors ultimately brought charges against Mr. Rutley, including felony animal torture, domestic violence and witness intimidation. After several weeks, the veterinarians concluded that the rear leg couldn't be saved and the puppy had another surgery to amputate it. After recuperating in a foster home, Brownie was adopted by friends of mine, a couple with the time to devote to her and lots of land for her to roam. Their love of animals is clearly demonstrated by the fact that they share their home with two other dogs and numerous cats - all rescues - and by the volunteer work they do for several local animal organizations. They renamed her Annie, and she continues to thrive in her new home. In February, Mr. Rutley pleaded no contest to the domestic violence and animal torture charges and pleaded guilty to two others. But Annie faces more surgery and both the quality and length of her life have been compromised by the beating. My friends felt strongly that Annie's voice should be heard by the judge when he considered the appropriate sentence. Both the prosecutor (who, by the way, had refused to reduce the animal torture charges in negotiating a plea bargain) and the victim advocate assigned to the judge fully supported the idea, and encouraged Barb and Jerry to write a letter before sentencing and arranged for Jerry to speak at the hearing. Their letter outlines Annie's medical condition and future prognosis: her eight hours of surgery to date; the knee that was so severely fractured it had to be amputated; the elbow "held together with surgical steel bone plates, four screws, numerous pins and surgical wire"; the additional surgery she faces about one year from the initial injury to remove "any of the metal that can be removed, so that it doesn't cause her pain or be a source of infection later in life." And, "her right front leg will always be a little shorter and turned out, so she will hobble on the front leg while trying to balance without a rear leg." The veterinarian has told them that Annie's injuries are consistent with her being hit "at least 3 times with great force." The Animals and Society Institute also submitted a letter to Judge Swartz. As part of our Rapid Response program we contact judges to urge that the sentence include psychological treatment with the AniCare model to prevent recurrence of the violent behavior. In this case, however, our main point was to acknowledge the importance of allowing the victim, Annie, to be considered; the letter said in part that animals "can appreciate not only the physical pain of abuse, but the more emotional pain of an exploitative relationship." It appeared to us that Mr. Rutley would be sentenced to prison, and we mentioned that he should receive AniCare or other treatment before his eventual return to society. I was only 5 months old. He got mad at my owner. Then he hurt me -- he beat me at least 3 times. He broke out some teeth and broke 2 legs and then he took me to a park and he left me -- but I couldn't walk and I was afraid. Jerry had another message for Judge Swartz: "despite all the challenges she has faced, we want you to know that she is still a sweet spirited girl." Annie's voice was heard loud and clear in that courtroom. Her will to live, her capacity to again enjoy life and begin to trust members of the species that so horribly abused her (see a recent picture of her, above, relaxing at home), is a lesson that Annie can so beautifully teach us all.